Taylor and Cunliffe (2016) provide a window into the world of the plankton in which they focus on a rarely studied component, the planktonic fungi (mycoplankton). 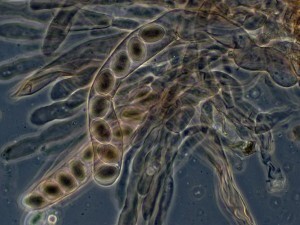 Marine mycoplankton exist as free-living filamentous and yeast forms or as parasite of other planktonic species. Their roles in the pelagic ecosystem have largely been surmised by comparisons with terrestrial and aquatic analogs. The studies to date have focused on single snapshots of mycoplankton diversity. Yet, time series data sets can be powerful tools that can enable the description of the key environmental drivers that influence planktonic communities. For example, time series of other planktonic groups, such as the bacterioplankton, have shown that there are annually repeating season-scale patterns in diversity that relate to changes in environmental parameters, such as seawater temperature or organic carbon availability. Taylor and Cunliffe followed the mycoplankton communities at a long-term monitoring site in the Western English Channel. This site, L4, is influenced by the influx of freshwater from the Tamar and Plym rivers. It turns out that this riverine input drove mycoplankton alpha diversity. They also found that chytrid blooms matched diatom blooms over consecutive years. [Their] data empirically reinforce the developing paradigm that, similar to terrestrial and freshwater fungi, marine mycoplankton occupy a complex range of niches as saprotrophs, nutrient recyclers and parasites. Mycoplankton have to be considered in order to understand the structure and function of the coastal pelagic ecosystem.